This pattern is available in print for $6.99. 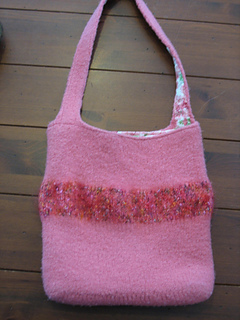 From the pattern description: A simply-shaped, felted bag to knit in 3 sizes for women and girls. 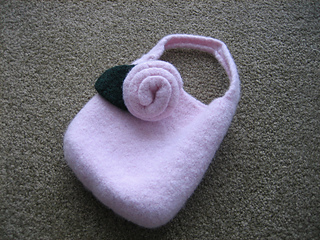 Small (after felting approx. 5” high by 5.5” wide), medium (after felting approx. 7” tall by 7.5” wide), and large (after felting approx. 10.5” tall by 11” wide). Uses 210, 420, 630 yards worsted weight (20 st/4”) 100% wool yarn. 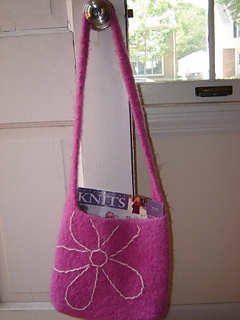 Along with detailed knitting directions, this leaflet contains excellent instructions for felting.